Last year, I released a new 8-week Bible study called Beginnings. Together we studied the first 11 chapters of Genesis. It was a joy to read your comments and see your excitement as you studied the Word of God. It was always my intention to write more lessons, but the year quickly flew by as I worked to complete Song of a Wounded Heart. Now that the book is about to be released, I want to return to writing more Bible study material. Although preparation for speaking engagements and retreats will always take precedence, I hope to complete another 8-week study in the next few weeks. Beginning Tuesday, February 5, I will re-post the first 8 sessions of our Genesis Bible study. Watch for them to be published each Tuesday morning to my website and then posted to Facebook. This will enable new readers to catch up with us and will encourage review for those who studied it last year. Then, April 1 we will begin a more in-depth study of “The Life of Abraham” based on Genesis 12-23. 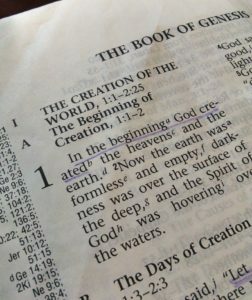 The word Genesis means “beginnings.” I hope you will join me on this adventure through the beginnings of the earth from God’s point of view, whether you are new to studying the Bible, or a veteran. Our God is an amazing Creator and loving God. We will learn a lot about His personality as we study how He interacted with mankind from the very beginning of our existence. I encourage you to begin your time with prayer, asking the Father to open your eyes to understand His Word. Then read the passage from the Bible before you read my thoughts. After you have read the devotional, pause to ponder the questions at the bottom of the page. Finally, add your thoughts to the comments section. When we share thoughts and questions, we can learn a lot from each other! How did your relationship with God begin? When did you first consider believing in Him? Choosing a place and a time to read the Bible helps us be consistent. When and where will you plan to read this Bible study each week? Let the adventure begin! See you next week!